Las tranquilas aguas del lago Pyramid son perfectas para principiantes. Se proporciona una orientación de seguridad y el equipo necesario. Elija entre excursiones matutinas o de madrugada. Spent an idyllic morning paddling around Pyramid Lake with our guide, Mike, and two fellow adventure seekers. It was a cold morning, but without a breath of wind and the mist rising up off the water was very atmospheric. Mike is very personable and knowledgeable about the local area and the wildlife. We had a great, relaxing time cant think of a better way to spend a morning in Jasper. Went on the morning tour and had a really great time. Mike is lovely, really friendly and knowledgeable, the lake is beautiful and so quiet and peaceful. Really recommend this tour if you're staying in Jasper. 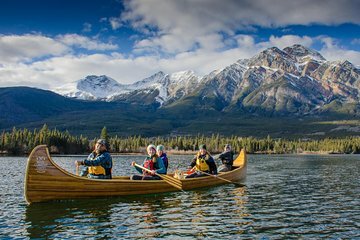 This canoeing adventure was one of the highlights of our trip to the Canadian Rockies. Mike was a very knowledgeable and fun guide. My husband and I have canoed a lot, and after this first outing, Mike was able to set us up with a canoe to explore 2 other nearby lakes during our visit. We'd highly recommend this trip to anyone wishing to get a taste of nature up close. We saw loons and osprey during our trip. A gem! This tour was spectacular! Mike was very friendly and knowledgeable and gave our family a wonderful experience. The views in and around the lake are really world class. I HIGHLY recommend this tour.